The Intimidator Refit is equipped with two shuttle bays. Shuttle bay 1 is located on Deck 7 and has support facilities on decks 6 and 8. Shuttle Bay 2 is located in the very aft section of the ship on Deck 27 with fighter support facilities on Deck 28. Both shuttle bays are equipped with a series of emergency containment field generators to both prevent wide scale loss of atmospheric pressure, and to isolate any fires or chemical leaks which might occur in the course of shuttle bay operation. The Primary shuttle bay is the largest facility onboard the Intimidator class, extending through the majority of the saucer section on decks 6 and 7. Due to the mission profile of the Intimidator Refit Class, the shuttle bay extends larger than normal for a vessel its size to accommodate runabouts and ships smaller than Courier-grade that may be the primary mode of transport by entities the vessel�s crew encounter. The Main shuttle bay is directly linked to the vehicle storage bays on deck 8, allowing for ground vehicles to be deployed as rapidly as possible in combat situations. Shuttle bay 1 holds the ships primary compliment of shuttles and runabouts, including 1 type 5, 2 type 9, and 4 type 11 shuttle craft as well as, 6 concord, 2 Mustang, 1 Delta Flyer, 2 Argo Class, and 6 Iron Horse class Runabouts. The layout of the Intimidator Refits shuttle bay has been redesigned in order to facilitate greater traffic flow in line with the ships role as an evacuation support platform. 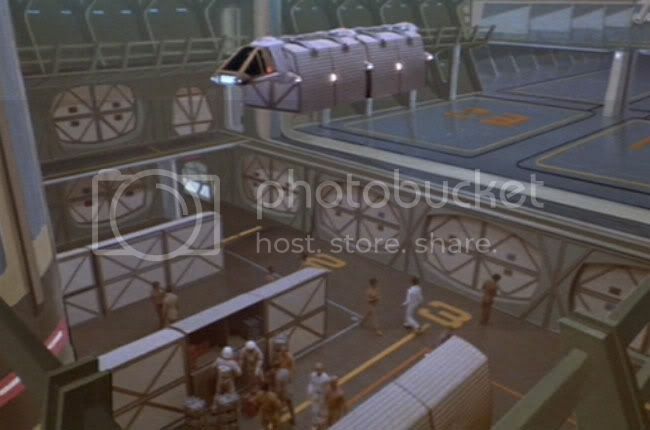 Several of the Hangers in the main shuttle bay can be converted to emergency quarters should the ship be severally damaged or an influx of evacuees be taken aboard. The Secondary Shuttle Bay is recessed within the ship beyond the bay doors to allow for fighters to execute combat landings when needed. The secondary bay has two large doors, the primary doors which open out to space, and the secondary doors which open to the bay itself. This was done to allow the primary doors to be left open in combat situations to allow for emergency landings, while preventing enemy vessels from accessing the main hanger bay. The Bay itself is based off of the design of the Constitution Refit in an attempt to optimize the cargo capacity of the bay. The secondary shuttle bay holds the remaining shuttle compliment of 2 type 5, and two 2 type 11 shuttles as well as 2 Beowulf Refit, and 6 War Hammer class runabouts. Shuttle bay 2 is directly linked to the fighter operations center by 6 lifts in the landing bay and a number of shuttle lifts in the primary bay itself. To better fulfill the role of a Cargo depot the shuttle bay is also tied in to the ship�s cargo lift system and several cargo bays are located directly adjacent to the bay to provide overflow support in needed. While bay two is more rounded to combat operations and the transfer of cargo, is can be rapidly reconfigured to provide support for more specialized operations. The fighter operations Center is composed of two hanger bays, which run through the body of the ship into the star drive section. These hanger bays support the ships fighter squadron and have been specially designed to minimize the time needed to completely turn a fighter over from landing to launch. The ships fighter compliment is split evenly between the two hangers, with each one holding 8 Viper Mark IIs, and4 Viper Mark Is . The Compliment of 2 Falcon Class Advanced tactical Scouts is maintained in the Forward section of the Starboard hanger bay primarily because they are too large to employ the intimidator Refit�s Rapid Acceleration launch tubes, and must launch through the Aft Landing Bay. The six primary lifts six primary lifts located in the landing bay are linked directly to the fighter bays, allowing for fighters to be maintenance almost immediately after landing. These lifts also serve to partition the maintenance bays into 4 separate sections, minimizing the damage done in case of the accidental detonation of munitions or during other hazardous situations. With this rapid deployment system, the Intimidator Refit can provide support for a far larger number of fighters then it is normally equipped with. Damaged fighters can land in the Aft Landing Bayand receive emergency maintenance before being sent back out into the fight. The Hangers are organized to allow for the easy prioritization of repairs. Fighters which are not likely salvageable are kept in the aft most section of the hanger bays, while combat ready fighters are kept in the front bay. The Intimidator Refit employs an experimental Rapid acceleration launching system. This system, which was successfully pioneered on the Huron class carrier, and later on the Command carrier was significantly redesigned for use on the smaller Intimidator Refit. The ship is equipped with a total of 6 launch tubes, 3 on the port side, and 3 on the Starboard side. Each launch tube is connected directly to the hanger bay to allow for fighters to be launched as quickly as possible. Each launch tube is controlled from a Launch Control Center, directly adjacent to the tube, allowing deck hands to monitor every step of the launch process, and abort at any point should it become necessary. Each launch tube is open to space during combat operations; this allows multiple fighters to be put in play at once. The tubes are partially isolated with an atmospheric shield, and then depressurized to allow the fighter being launched to achieve the maximum possible acceleration within the tube. Each tube can launch a fighter every 15 seconds, allowing for a very impressive turnover rate. When the tubes are not in use they are retracted back into the Vessel, and a large retractable hull section covers the openings to prevent the systems from being damaged during battle. The Intimidator Refit is not a dedicated carrier by any means. The Fighter wing stationed onboard the Intimidator refit normally consists of 16 Viper Mark IIs, 8 Viper Mark Is , and2 Falcon Class Advanced tactical Scouts as well as a small contingent of runabouts which serve to support the Fighters in conducting operations. A select number of Intimidator Refit Classes are in the process of receiving a Heavy Combat overhaul, including an expansion of the ships fighter facilities to allow it to more effectively combat the Cardassian bio fighter and raider. This design is still in the early stages of developments, however if the Cardassian war machine continues to produce Bio Fighters and Raiders capable of destroying most Starfleet fighters the Intimidator may yet again take on another new role as a dedicated carrier battleship. The Intimidator class yacht is designed to serve essentially the same function as any other ship's yacht, and is simply a modified version of the Sovereign Class Yacht. Like all of the new generation, it is a warp capable design intended to be capable of short and medium duration interstellar missions as well as interplanetary trips. The Yacht is capable of warp 9.5 in an emergency for up to 3 hours, but its normal cruise speed is warp 5, giving it the same general mission radius as a Danube class Runabout. The ship contains a small cargo bay and transporter system, two staterooms, a shared room for the crew, plus a living area and separate flight deck. The normal crew is 2, although a single person can handle the flight controls. A third crew member cares for the guests. The primary redesign of the Intimidator Refit�s Yacht related to increasing the top speed, and overall survivability of the Captain Yacht. The interior and exterior of the Yacht have remained identical of the sovereign yacht, and the ability to fire tachyon bursts has been retained.